Ichthyosis is derived from the Greek word "ichthys" meaning "fish". It is a skin disorder in which there is formation of dry, thickened, scales or flakes on the skin, which appears like fish scales. It is seen to be a Genetic disorder that is passed from parent to child or that occurs spontaneously. 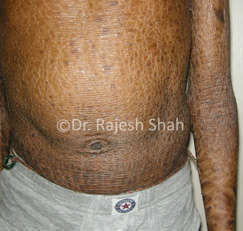 Use of harsh soaps or detergents make the skin dry and are known to cause ichthyosis. Cold weather is also an important factor which increases dry skin and leads to ichthyosis. Certain soaps or lotions containing certain scents or perfumes may also trigger this. Acquired ichthyosis is not inherited and occurs for the first time in adulthood. It is usually associated with some general systemic diseases, such as under active thyroid, sarcoidosis, lymphoma, generalized cancer or HIV. It may be provoked by certain medications (such as kava, nicotinic acid and hydroxyurea). Dry skin, scaling and flaking of skin. Impaired hearing or eyesight: Excessive skin may build up over the ears or eyes causing partial deafness or blurred vision. Often a physician is able to diagnose ichthyosis by examining the skin. A family history if available is useful. In some cases, a skin biopsy is done which is confirmatory. Ichthyosis can be treated, but it cannot be cured. The treatments are designed to relieve the symptoms. Common treatments consist of moisturizing and exfoliating the skin. This helps prevent dryness, reduce scaling, cracking and build-up of skin. Use of moisture retaining creams or ointments such as Petrolatum, lanolin or urea-containing preparations after a bath or shower helps in maintaining the skin moisture. Retinoid is also used for some conditions. Some times exposure to sunlight can improve the condition. If there is skin infection or in case of body odor, timely use of antibiotics is helpful. Avoid taking hot baths or showers as they dry out the skin and use lukewarm to cool water. Soap should not be used on the affected skin because it irritates and dries the skin. One can use the soap substitute Cetaphil lotion which is available from the pharmacy without a prescription. Avoid rubbing the skin dry after you bathe. 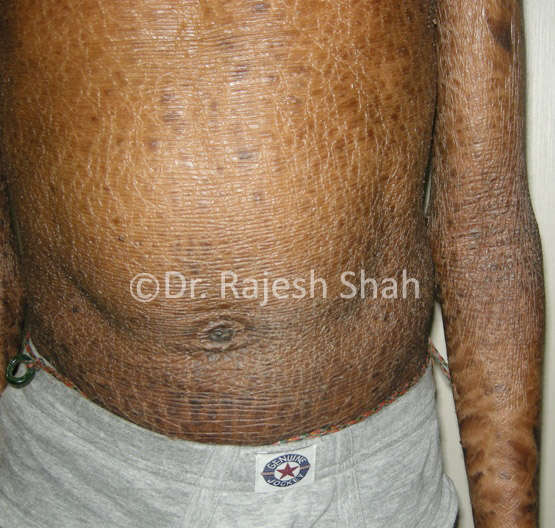 There is no cure for ichthyosis in homeopathy. It is a life-long condition which can be managed or controlled in the best manner with homeopathy. Homeopathy helps slow down the underlying disease activity in ichthyosis. The dryness, scaling, cracking, thickness of skin and build-up of excess skin may reduce with homeopathy medicines. Homeopathy is recommended to see if it works in a given case, for about six months. If there is improvement, it should be continued; or else, it may be terminated. Mr M.M.K, a business man of 46 years, PIN: 11711 visited the clinic on 22 January 2009 for his complaints of Meniere's disease.